Online Resource A Dance on the Grass (Christopher Grundy) This is just beautiful. A great song to sing in a hospice or in a similar setting when someone is facing dying. Video with links for a free download. TiS 639 / AHB 619 / GA241 / Lau445 May flights of angels lead you on your way (Quinn) A quite formal song, to a familiar Orlando Gibbons tune (SONG 1). This would be good for a funeral of one who has suffered, or someone who looked forward to being met by the angels and saints. *ATAR656 Heavy our hearts (Watts / Lord) A lovely soothing chant naming our heaviness and seeking God's shelter and healing. VU182 Stay with us through the night (Farquharson) Simple and gentle sorrowful, but hopeful song. Iona (Common Ground, Enemy of Apathy) / CH730 / GC(II)864 / CP489 From the falter of breath / The Last Journey (Bell) Beautiful words to a Celtic folk tune. Organ sample. Lyrics and sample music. Another sound sample. CH464 / A&M521 / SP139 Though hope desert my heart (John Bell) Excellent words of grief / trial, with the knowledge that Christ has been there first. CP(E) 397 Christ the way of life possess me (Dudley-Smith) Not strictly a funeral song, but very suitable song about following Christ in life until death. Old fashioned, but inclusive. Nice imagery "Path of life before me shining". Lyrics. TiS 695 Fare well we come to send you on your way (Thwaites) Good words to a very familiar tune (Finlandia). Has masculine language for God. VU496 / W&R516 Grief of ending wordless sorrow (Wren) Beautiful words. A sample of a choral arrangement can be found here (loads a pdf). GC(II)574 God weeps with us who weep and mourn (Troeger) Excellent words, but the tune is not intuitive. Could probably be sung to another tune (8.6.8.6.8.6.8.6). I will try to look this up at some stage. Sheet music and lyrics. Sound sample. NCH368 Sheltered by God's loving spirit (Patterson) Helpful words to a traditional hymn tune that would be easy to sing (BEECHER). FFS45 Lord turn our grieving into grace Excellent words "Lift up the stone that weighs us down". Best sung in two parts if you have enough singers to do that, but can be sung well without the 2nd part. MV017 / FFS24 /Srce2-145 God in the darkness (Smith) Great words which would work well at the beginning of a service of worship. Set to a fairly simple hymn-like tune by Colin Gibson. Verse 1: "God in the darkness, God beyond our knowing, patient creator, seed in secret growing, rock of the living, water ever flowing, come and renew us"
ATFG540 NCH499 CH726 UMH356 VU581 ELW639 HPP342 GtG822 / PH400 G(II)474 GC666 GC(II)650 G(3)756 W&R415 Cha536 URW174 / URW175 / URW176 StF485 Lau906 In all our living / When We Are Living / Pues Si Vivimos (Mexican traditional) A simple and lovely song, in English and Spanish (though not all hymnals include the Spanish lyrics). Translations vary widely, so check yours. URW has two translations (URW174 and URW175) . Iona (LFB) / CH734 / CP296 O Christ you wept when grief was raw Lovely honest words. There are a couple of tune options. I like best ROCKINGHAM. Lyrics here. AA91 Lord of all love A good hymn of trust. Can also be sung to ROCKINGHAM. Lyrics can be viewed here (loads a word document with many other useful funeral resources). CH735 / StJ / GC(II)868 Go Silent Friend (Bell) To the tune of Londonderry Air, this would be very simple to sing at a funeral. The language for God is masculine. It can also be read by a single voice as a poem, and this is what is suggested in CH. CH731 When grief is raw and music goes unheard (Wren) A poem for a funeral with communion. *TiS 682 / ATW 490 / GA236 / AA151 When human voices cannot sing (Murray) Lovely words of healing in the face of grief. I prefer this sung to ST COLUMBA, which is the tune in GA and TiS. Lyrics (loads a word document with many other useful funeral resources). NCH297 / CH736 / VU706 / StJ / AA45 HPSS528 / W&R518 / Cha649 / URW131 (Murray) Give thanks for life the measure of our days Good and joyful words of remembrance. Sung to the familiar tune SINE NOMINE "Give thanks for those whose lives shone with a light caught from the Christ flame, gleaming through the night, who touched the truth, who burned for what is right: Alleluia! Alleluia!" Here in This Place In birth, behold a mystery (Wiltshire) These words can be sung to many tunes (88.88), and notes the phases of life, including birth, joy, pain, death, love and life. Good, straightforward words. Free sheet music available here. 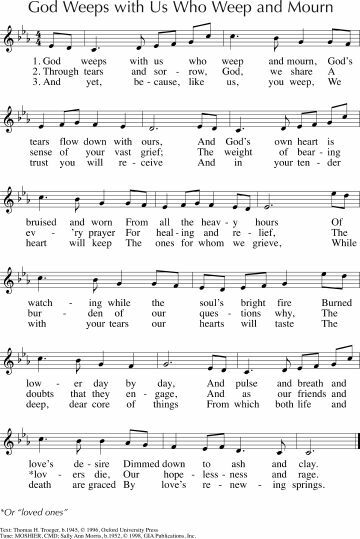 G(3)976 Dwellers in the Holy City (Dufner) Funeral song about calling the residents of heaven to welcome the one who has just died. Boring tune, but very easy to sing. Lyrics and lead sheet. Sound sample. NCH476 / CH565 / VU716 / WoV781 / LBW294 / ELW596 / GA454 / SFFS 2212 / HPP395 / G(II)427 / GC603 / GC(II)598 / G(3)685 / CP401 / W&R424 / Cha619 / SP296 / URW170 My life flows on in endless song (Lowry) A wonderful hymn. Lots of great recordings of this are available too. It's not so great if it is not familiar to your congregation, but once known, it is worth hanging on to. 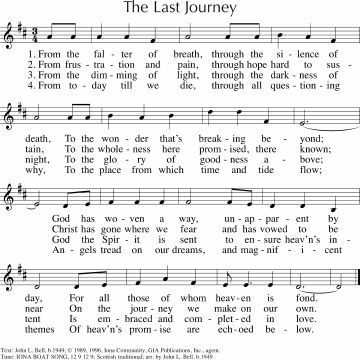 *Tune In: All will finish well: (Brown) I think this song would be appropriate for an unexpected or untimely death, particularly of someone who risked life for the sake of the gospel. "You, in all our darkness, you offer peace. You of the ages, in this world where injustice reigns you are in the midst of pain". Lyrics and sound sample. Online resource We celebrate this life (Wiltshire) Good words of all the things we want to celebrate about a life fully lived, including the sorrowful times. Free songbook download. *G(II)562 / GC776 / GC(II)767 / G(3)874 / URW027 Now Let Your Servant Go (CONDITOR ALME SIDERUM / Ruth Duck) Excellent words from Ruth Duck present the Nunc Dimittis to a familiar chant tune. If you have a non-chanting congregation, just use the tune for "Creator of the stars of night" (NCH 111) which is an adapted chant and no-one will ever suspect that they were chanting. SP&P207 Now you are releasing your servant (Grundy) A more modern Nunc Dimittis. This will need to be taught, because the timing is a little tricky. Sound sample (scroll down). *Online Resource Holy One, Now Let Your Servants A nice sending out song that picks up the song of Simeon. Probably too tricky for a congregation to sing the first time they hear it, but perhaps your musicians can play it. Sound sample, lyrics and source. *TiS 324 / GtG545 / AHB 248 / PH603 / PfAS1051 Lord bid your servant go in peace (LAND OF REST) Inclusive save for the last verse which is a Trinitarian blessing. Familiar American folk tune. Lyrics can be found here in an order of worship. It could also be sung to the tune MORNING SONG (Awake awake to love and work) - just the first four lines of the tune. Taizé / URW385 Let your servant now go in peace / Nunc Dimittis (Berthier) Very simple and straightforward. *TiS 733 / VU903 / PH604 / 82Hml-499 Lord God you now have set your servant free (Whitney) A very straightforward and traditional blessing based on this reading. W&R632 / Cha512 When Aimless Violence Takes Those We Love (Patterson) Excellent words sung to the well known tune SURSUM CORDA. Lyrics. MV179 People let us walk together (Snowdon) A mournful (but still hopeful) song, that can be sung as 3 verses or as a round, written for a worship service to honour women killed in the Montreal Massacre of 1989. You can change the words to "People let us walk together" if the focus is not particularly on violence against women. MV179 Sisters let us walk together (Snowdon) A mournful (but still hopeful) song, that can be sung as 3 verses or as a round, written for a worship service to honour women killed in the Montreal Massacre of 1989. It would work well for any service or event (even a candle-light march) to remember women unjustly killed. FFS44 / W&R683 Little one born to bring us such love Hymn for a funeral of a small child; very simple tune and beautiful words of comfort. Words and melody line here (search for "little one"). CH733 We cannot care for you the way we wanted (Bell) Heartbreaking and realistic. Deals extremely well with the particular grief and regrets of losing a child, and would also be useful for one stillborn. 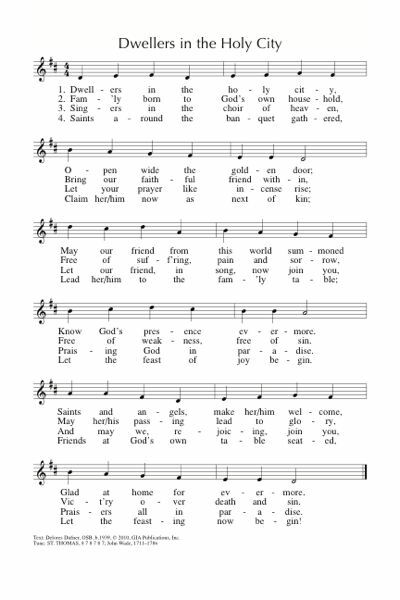 This hymn could be sung by the congregation (it's not too hard if they are musical), by a soloist, or read over an instrumental accompaniment. It requires addition of he or she and his or her where appropriate, so careful not to just copy and paste into your order of service. CH732 When Jesus longed for us to know (Bell) A simple, and beautiful song for the death of a child. It requires addition of he or she and his or her where appropriate, so careful not to just copy and paste into your order of service. NCH433 / CH727 / UMH707 / VU703 / HPP474 / GtG250 / W&R515 / Cha638 In the bulb there is a flower (Sleeth) A simple song of hope symbolised in nature. Lyrics and sheet music. FFS56 Sing no sad songs today (Shirley Murray) Specifically suitable for someone who has lived a long life; sung to NUN DANKET (now thank we all our God) so would be easy to sing for everyone. Lyrics can be viewed here (loads a word document with many other useful funeral resources). TiS 190 / NCH030 / HPP296 / W&R643 / Cha457 Colorful Creator God of mystery (Ruth Duck) Good words, I think this would be a good song to recognise the life of a painter, a musician, a poet, actor or writer. Excellent tune with nice twist at the end. Nice song of funeral!!!!! I love your blog of funeral songs. A lot of people still choose non-religious funerals, so they incline towards contemporary songs with which they closely identify. Thanks for this -- found something to use in future. p.s. the link to Sing No Sad Songs Today seems to be broken. We will live in the light of the risen Lamb!